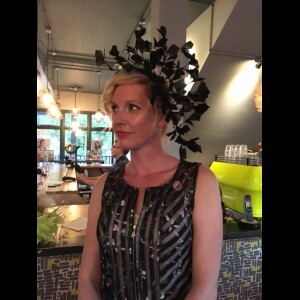 The black feather vine headpiece, easy to wear but striking. Please note this piece is not suitable for Royal Enclosure at Ascot due to base size. A very easy to wear design mounted on a black silk wrapped hairband. Tendrils of feather leaves interspersed with small swarovski beads. The vines are wired so the piece can be manipulated into the exact position you require. Can be worn on either the right or left side of the head.